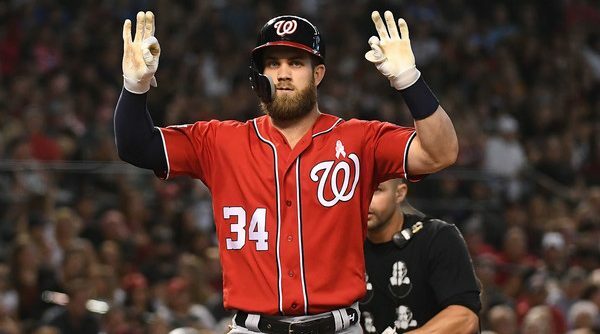 Home / 2018 Articles / Is Bryce Harper Doing Too Much? F.P.’s thesis? That when Bryce gets hot, teams stop giving him pitches to hit. (Cut to Joe Maddon nodding.) And when he stops getting pitches to hit, he loses his rhythm and takes awhile to readjust. The only player, F.P. said, who’s succeeded like that was Barry Bonds, who’s on the shortlist for Greatest of All-Time honors (don’t @ me). Intuitively, this makes sense. 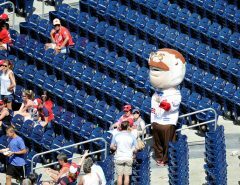 But it’s also important to view Harper’s struggles within the context of this Washington Nationals season. That Nats entered May a sub-.500 team. The face of the franchise might walk in the offseason. Everyone is hurt. 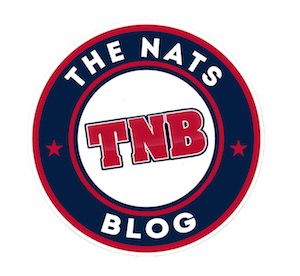 There have been many reasons for pessimism among the Nats faithful and far fewer curly Ws than were expected in the first quarter of the year. 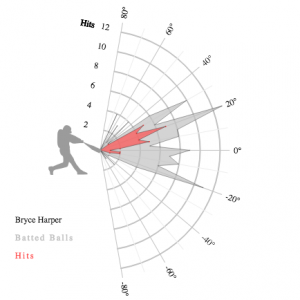 Harper is the team’s most talented hitter. Is it possible he’s trying to shoulder the load that comes with a struggling team himself? Is it possible he’s doing too much? Let’s unpack these: The Lost Rhythm and Doing Too Much. Fangraphs computes a statistic called Weighted Runs Created Plus (wRC+), a comprehensive rate statistic used to measure hitting performance that is both park and league adjusted, where 100 represents league average. 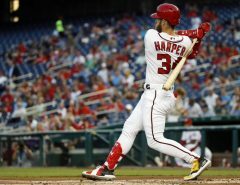 Harper’s career wRC+ is 141, meaning for his career he’s hit approximately 41% better than league average. Here’s his 15-game rolling wRC+ from 2018. We can see he started the year strong before steadily losing production as the season progressed. But is that because pitchers stopped throwing him strikes? Well, not really. Because they never have. For his career, Harper has seen 38.6% of pitches in the strike zone. In 2018, he’s seen…38.2%. That’s lower than league average and ranks eighth lowest in all of baseball this season just behind Aaron Judge and Giancarlo Stanton. If we break the sample out to include all years between 2012-2018, Harper’s faced the third lowest percentage of strikes behind noted free swingers Pablo Sandoval and Josh Hamilton. He’s never had pitches to hit. This ain’t new. 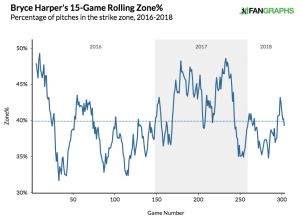 And if we look at the graph below, a 15-game rolling zone % from 2016-2018, we see that he’s faced lower sustained percentages of strikes thrown his way, including that 2016 Cubs series where he walked 13 times in four games. He’s not getting pitches to hit now, but it’s been worse. So as far as losing rhythm goes, I don’t buy it. We need to look at his approach. Baseball is not the ultimate team sport. Sure, all nine starters rely on one another to do their jobs well, but hitter vs. pitcher is as one-on-one as it gets in sports. 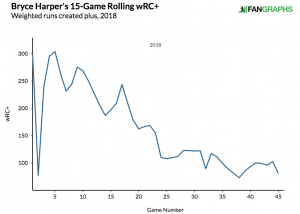 So if Harper is frustrated at the plate (frustrated enough to call the rest of his supporting cast the Syracuse Sky Chiefs), we might expect him to try a little harder at the plate to create runs. Maybe he’s dropped his launch angle to create more loft on his hits? But that’s not true. In 2018, his average launch angle of 12.9 degrees would rank a career worst, per Statcast data. Nor are the balls he’s hitting in the air any less likely to leave the yard, per Fangraphs. In fact, his 28.3% HR/FB rate is nearly 10 percentage points above his career mark. His strikeout and walk percentages both best his career averages, but maybe it’s something in his pitch-by-pitch approach that’s causing him to struggle? We can see that, of late, he’s been swinging and making contact with more pitches outside of the strike zone, though he’s not hitting the ball any less hard than in years past. He ranks 55th out of 389 hitters in average exit velocity at 91.7 mph (Mike Trout ranks 58 on this list), and his hard hit percentage (balls 95 mph+) of 48.4% ranks 43. Last year his hard hit percentage of 42.9% ranked 56. That leaves us at batted ball luck. If he’s hitting the ball hard and not getting hits he must be a bit unlucky, perhaps? 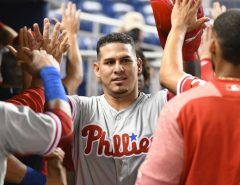 His 2018 BABIP of .193 is off his .316 career mark by quite a bit and ranks third worst in all of baseball. We might expect that to rise by a point or 100 in the coming weeks and months, but there’s potentially more at play. 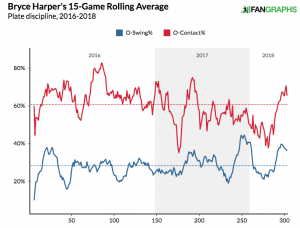 This year, Harper is pulling the ball far more than last year (45.9% vs. 35.5%). I had trouble finding reliable shift data (comment if you can find a good source! ), but teams will load up the right side of the infield against Harper from time to time. So while it’s possible he’s hitting the ball hard into well-positioned fielders, his 2018 pull percentage is also in line with the number he posted in 2015. You know, when he was the National League MVP. I do wish F.P. Santangelo would quit or be fired from his job. I have got to the point where I bought a small FM Radio so I can listen to 106.7 and turn the tv sound off. So much crap in so little time.